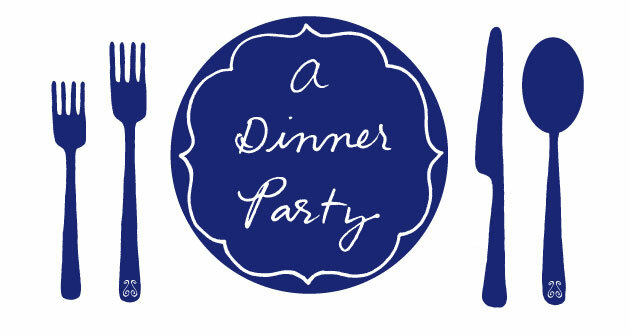 dinner party: what's for dinner, michelle bernstein? I feel a bit of hometown pride for today's Q&A subject, Miami-based chef Michelle Bernstein. Bernstein, a James Beard Award winner, describes her food as "luxurious yet approchable," and as you'll see in the Q&A, it's true. She's no stranger to a jar of tomato sauce--or foie gras torchon. Chef Bernstein has three South Florida restaurants: Michy's, a Miami bistro with a Jewish and Latin-influenced menu, Sra. Martinez, which serves tapas in Miami's design district, and Michelle Bernstein's, a new restaurant at the Omphoy Ocean Resort, a boutique hotel in Palm Beach. 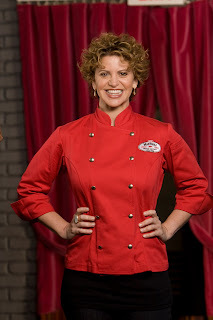 In addition to being a fantastic chef, she's also as nice as can be. I've had the pleasure of meeting her in person at an event, and she's as vibrant as the city from which she hails. Here are her thoughts on entertaining at home. A month ago with family (husband, parents, sister and husband, uncle and some friends). Foie torchon paired with a homemade marmalade a neighbor made; linguine with shucked clams, pernod and roasted tomatoes; Meyer lemon pound cake with fresh cream and berries. Do I have to pick one? I like to have a variety of beer and wine. Cocktails are something we serve when throwing parties, not with dinner. Triste, Tito Puente, Cole Porter. I can do anything if it’s a day ahead! I guess if I wanted to go simple – roast chicken over root vegetables, quick salad of leafy greens, tomatoes, crumbled blue cheese, quick cobbler of whatever fruit I can scrounge up. I do it myself. My hubby helps clean, but I’m pretty neat in the kitchen. I love to use good-quality tomato sauce, for those really quick fixes. Sometimes we get hungry and need to eat and run (I’m talking 20 minutes) so I boil really good pasta, sauté garlic and onions and add it to store-bought sauce, grate fresh parmesan over the top and toss a quick salad. Really simple stuff, upside down cakes with fruits of the season like mango with honey. Cobblers are simple and delicious. Pot de crème is also another easy one. My time in Miami has been severely limited, and it's killing me that I've haven't yet been able to try Michelle's food - even more so after this Q&A. Thanks for this, and for giving me an intense craving for that clam linguine! We ate at Michy's and it was great. Can't wait to try her place in Palm Beach. The Jewish-Latin-French thing at Michy's is definitely something I haven't seen anywhere else. Still think about that homemade pasta with giants heads-on shrimp more than a year later.